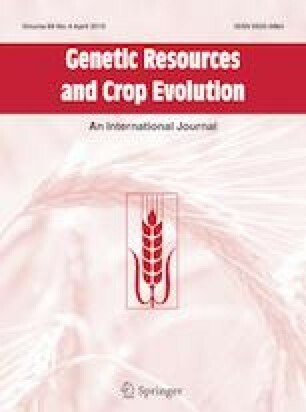 Development of anthracnose resistant hybrids of the Greater Yam (Dioscorea alata L.) and interspecific hybrids with D. nummularia Lam. Controlled pollinations were conducted to develop Dioscorea alata L. hybrids resistant to anthracnose (Colletotrichum gloeosporioides (Penz.) Penz. & Sacc. Overall, 10,410 hand pollinations were carried out with Indian (IN) and Vanuatu (VU) clones in 53 different parental combinations, including diploids (2x) and tetraploids (4x) female and male plants. Pollination efficiency and seed set were comparable for IN2x × VU2x (54.6% and 23.0%) and IN2x × IN2x (57.4% and 28.9%). However, seedling survival with better resistance to anthracnose in nursery under natural disease pressure was higher for IN2x × IN2x (67.3%) compared to IN2x × VU2x (47.8%). IN2x female clones were crossed with VU2x and VU4x male clones in 12 parental combinations each. Pollination efficiency was higher for 2x parents (54.6%) compared to 4x parents (47.0%) but seed set (32.8%) and seedling survival (71.7%) were significantly higher for crosses between IN2x × VU4x. Overall, remarkable variation in pollination efficiency, seed set and seedling survival was observed between different parental combinations even when the same pollen parent was used. Interspecific hybridization between D. alata IN2x females and D. nummularia Lam. Vanuatu polyploid male was found to be successful with considerable variation in pollination efficiency, seed set and seedling survival (49.0, 20.8 and 35.3%). The hybrids exhibited intermediate characters between the two species with high tuber yield, anthracnose resistance but with fast tuber flesh oxidation. These results demonstrate the scope of polyploid and interspecific hybridization and the need for the international exchange of germplasm for D. alata genetic improvement. The online version of this article ( https://doi.org/10.1007/s10722-019-00756-y) contains supplementary material, which is available to authorized users. This work was financially supported by the ‘Agropolis Fondation’ under the reference ID 1403-023 through the ‘Investissements d’Avenir’ programme (Labex Agro:ANR-10-LABX-0001-01). The World Bank offered to Dr. K. Abraham two short term consultancies for providing technical assistance to the VARTC for the genetic improvement of yam by hybridization for the project ‘Increasing Resilience to Climatic Change and Natural Hazards (IRCCNH)’. Special thanks are due to Mr. Ruffino Pineda, coordinator of the project in VARTC for facilitating the field work.